One of the most prestigious awards ceremony in the world of architecture, the annual World Architecture Festival (WAF), together with its sister event, the INSIDE festival, provides architects and interior designers around the world the opportunity to be recognized for their contributions to the field. The highest honors in the industry, the INSIDE World Festival of Interiors is a one-of-a-kind forum combining awards and conferences for recognizing, inspiring and nurturing global talent. anySCALE was represented by co-founders Andreas Thomczyk, Karin Hepp, Tom Chan, and director of Shanghai office, Simon Berg, joined by Polyphony co-owners Guobin Yang and Wenlin Li. The team of delegates presented the submissions for the shortlisted projects to the panel of judges. Polyphony won the distinction of “Highly Commended”. This year’s festival saw the entry of 78 projects across the categories of hotels, restaurants, retail and office spaces. 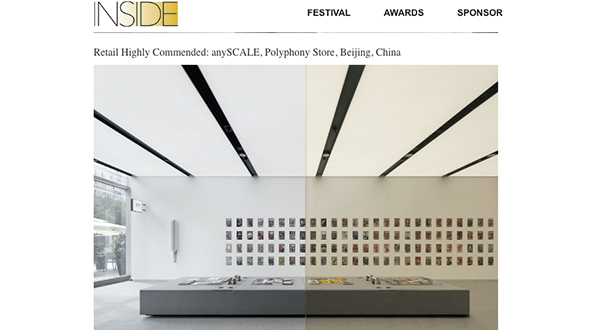 Acclaimed by the judges, Polyphony received the honor of being highly commended in the retail category at INSIDE on the final evening of the festival. All the winners and commended entrants attended the Gala dinner, and enjoyed a wonderful speech delivered by world-renowned architect Norman Foster. Inspired by the style of minimalism adopted by Apple, Polyphony was conceived as a haven for music lovers and comic book aficionados, juxtaposing the old, represented by the vintage collector’s edition items, and the new, in form of the clean and modern interior design. The values and professional background of the client, and the expertise brought by anySCALE in transforming the vision into reality, translated into the creation of a beautiful space full of spirit, sparking joy and awe in the minds of visitors.